We continued to track our successful options idea from earlier in the week yesterday morning, as the SPY Weekly $188-191 Calls once again provided ammunition for some serious gains. Despite already having moved up considerably, we mentioned our expectations that those figures would be pushed higher and indeed they were. As we did yesterday to save time, we’ll just outline the gains made by the bookend contracts of our observed range; similar gains would have been up for grabs in any of the contracts within. The $188 Calls extended their new high to 5.35, which represents a 226% overall move, and the $191′s pushed to 2.68- a gain of 587% over Tuesday’s low. In addition to tracking our initial idea, our trader’s chat participants* were offered a followup idea prior to the bell yesterday that yielded big-time profit chances as well. 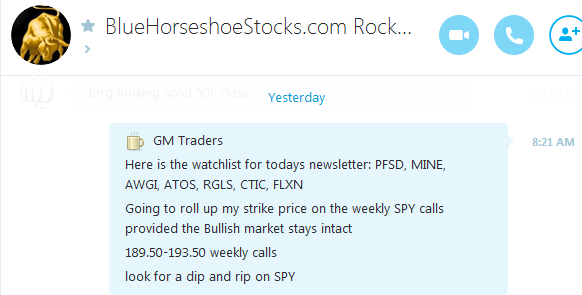 As you can see from the screen capture below, we mentioned the possibility of rolling strike prices up to the $189.50-193.50 range, and all of those contracts were winners as well. To give an idea of the gains available in that range, the $189.50′s made a move from 2.14-3.99 (+86%), while at the upper end, the $193.50 Calls made a 326% rip from .23-.98. All in all, there was no way to go wrong with any of our SPY Calls as the overall markets solidified their first three-day rally of 2016. *Participation in our daily trader’s chats which currently take place via Skype is fun, free, and as simple as sending a contact request to username ‘stocksumo‘. All of our loyal readers are encouraged to take part! 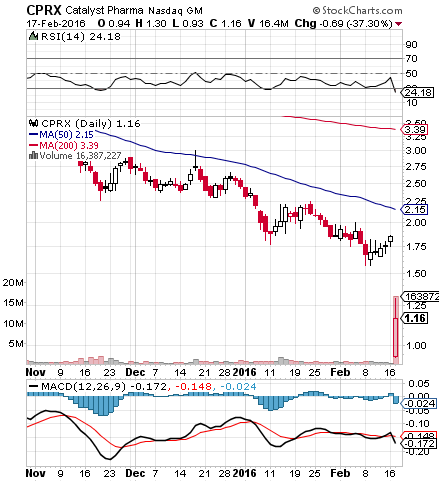 We’ve spotted what could turn out to be a solid rebound play in CPRX this morning. On the heels of the company’s announcement that the FDA had served it with a letter of refusal pertaining to a recent NDA filing, the stock absolutely tanked. The caveat is, the notice came with assurance that it was not related to the clinical data or perceived efficacy of the drug in question, but a filing error only. This means that the stock lost a good portion of its value in a single day for what seems to amount to nothing more than a clerical error (see chart below). We’ll be very interested to monitor the stock in coming sessions and observe its reaction.